Want to spend your European vacation in a land where everyone speaks English; tourists outnumber locals; and restaurants offer menus in five languages? Then skip this story. If, however, you relish discovering the hot spot of tomorrow before the KFCs and Hiltons invade, then inscribe Ukraine on your bucket list. It’s kinda, sorta, Russia-lite. In fact, it was ruled by Russia—then, after driving out the Nazis, by the Soviets until achieving independence in 1991. But hold the applause. After Putin grabbed back the portion called Crimea, the country’s pro-EU and pro-Russia factors skirmished until quite recently, halting tourist visits. After a four-year hiatus, today it’s safe—and wonderful—to visit. But because the infrastructure is still a bit dicey, the best way to do so is via a Viking River Cruise. Which I jumped on, the moment the “Kiev to the Black Sea” voyage hit my computer’s inbox: ten days of meandering along the Dnieper River with 160 other passengers, taking advantage of Viking’s many customer-forward amenities: complimentary wine and beer with meals. A menu that highlights Ukrainian specialties—borscht, chicken Kiev—as well as Chateaubriand, burgers and salmon. Lounging on the sun deck. Nightly entertainment (including an evening of Ukrainian pop singers). Free internet. Free daily excursions, led by friendly, informative guides. And the list goes on. The company has (admirably) hired Ukrainians to work the ship, from our sweet and sassy dining room servers (“No dessert,” said a friend. “Ha!” responded Irina in beyond-fluent English, “For you, double-double-double!”) to bus drivers and tour guides (the first such pair named Boris and Natasha. Really.) to a cabin-cleaning crew so swift that my pajamas were folded beneath my pillow before I hit the lavish breakfast buffet. They greeted us on our return from excursions with sweet treats. Lectures explained the country’s rich and tumultuous history. Lessons in the Cyrillic alphabet encouraged my lame attempts. We started in Odessa, a muscular working port anchoring the Black Sea, where Soviet oligarchs came to play in the sun. Russia’s Catherine the Great recognized this advantageous location and ordered her French pal, Cardinal Richelieu, to map out a city. 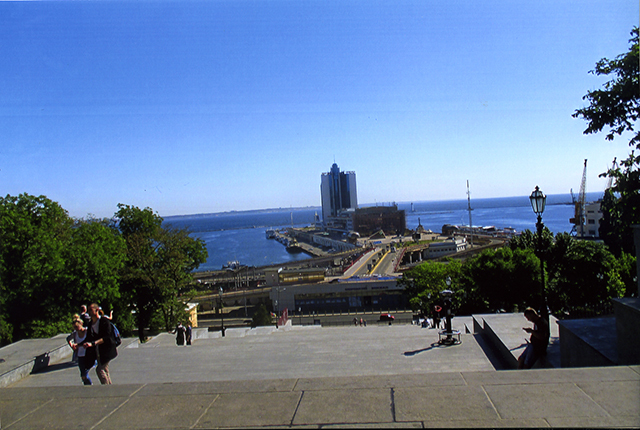 His toga-wearing statue stands at the top of a huffing climb up Potemkin staircase (named for the general who was her lover—familiar to fans of the movie classic, Battleship Potemkin.) Pushkin later lived here; so did Tchaikovsky. We seized our leisure time to explore Odessa’s shopping street, peering into boutiques, discovering a supermarket that rivals Kowalski’s, where I purchased bottles of vodka for $1. But Odessa’s Jews had nowhere to hide. A pogrom of 1905—the most hideous of many—exterminated 2,500, later topped by Romanian Nazi conquerors’ murder of 120,000. Of 66 synagogues, two today (which we visited) are active. Moms with their babies in a city park in Zaporozhye. Casting off at midnight, we sailed calm waters through forests ripe with birdsong, past anglers casting from docks and kids cannon-balling into the water as we approached Zaporozhye, a lively city of 750,000. In a park where once Lenin’s statue menaced, young moms gossiped while their toddlers played. 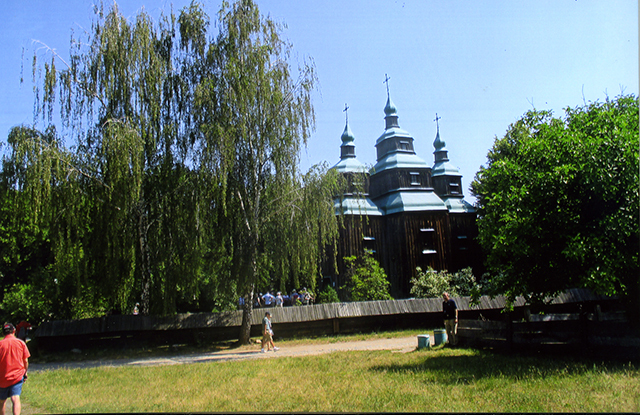 The river divides around a forested island, home of a replica settlement of Cossack outlaws. We peeked into its medieval armory—original helmets, swords, muskets—their barracks, the leader’s opulent home (fur bedspread) and a wooden stave church where these early Christians prayed to icons. On the opposite side of the island, Cossack stuntmen of today put on a show of daredevil riding feats, like hanging upside-down from a saddle as their ponies galloped at warp speed. Whip-cracking tricks and hokey jokes, too. It’s crazy fun. Synagogue Golden Rose in Dnipro’s Menorah Center. Our next stop, Dnipro, is known for rocket engineering, but its touristic payload is its history. Intriguing exhibits at the National History Museum include idol-like stone images of 700 A.D., on to chainmail of medieval times, and the ornate costumes of Catherine’s court. Nearby looms Transfiguration Cathedral. Catherine laid its cornerstone and Stalin transformed it into a Museum of Atheism. Today, ladies in headscarves light candles once again. Perhaps they were praying for the recent fallen. An open-air diorama brings home the destruction of 2014’s revolution: burnt ambulances, shelled tanks, charred ruins and stories of brave civilians, who supplied the rebels with food, clothes, ammunition—and even drove them to the front line. On a free afternoon, we wandered the main drag, looking for the new Menorah Center. Stopping at a hotel for directions, we were offered a “better” map from the Soviet era—never mind that where we stood was no longer Karl Marx Avenue. A high-school lad proffered directions, then volunteered to accompany us to the center, now a social service outpost for the (tiny) surviving Jewish community. 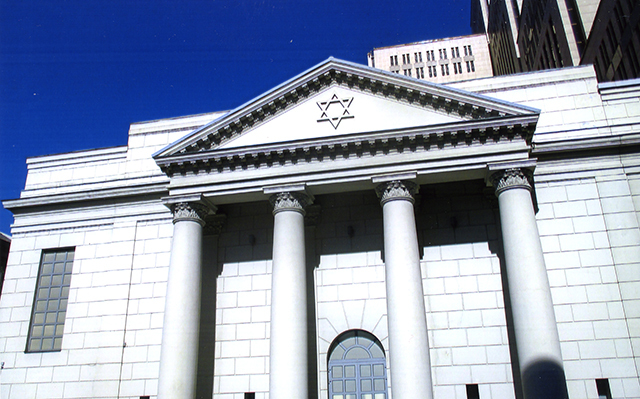 The glorious Golden Rose Synagogue of past days shines as its centerpiece. Scholars with curling forelocks and black yarmulkes continued their scripture lessons as I gazed on the Holy Ark. 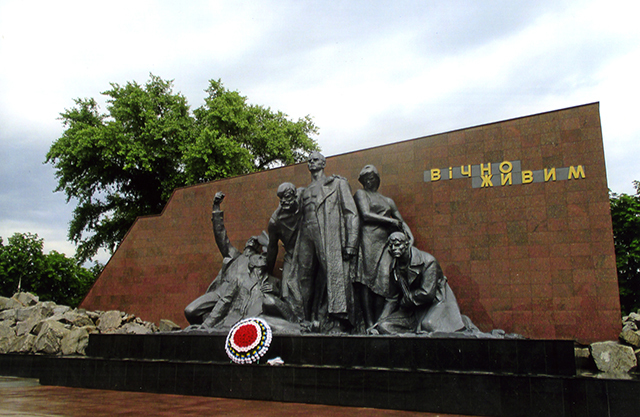 A solemn monument to the enforced famine caused by Joseph Stalin in the 1930s. The ship next anchored at Kremenchug, a town “unusual because it’s usual,” explained Nina, our guide: parents pushing strollers in the park (where, of course, once Lenin’s statue loomed), teenagers moving to the blast of boom boxes. A Viking perk on every voyage includes a visit to a local family’s home, and here we met the matriarch’s grandkids and feasted on her homemade slivovitz and pastries as she answered our many questions about how life goes on today. A stave, or wooden, church in the Outdoor Historic Museum Village near Kiev. Finally! Kiev, the capitol itself! We docked aside a festive esplanade—merry go round, Ferris wheel, sidewalk cafes, beanbag chairs for snuggling couple—and for the first time on our voyage, spotted a few fellow tourists. (There’s even a McDonald’s.) In Kiev’s 12th-century Golden Age, the city was twice as big as London. Today, shiny new high-rises of oligarchs rise amidst the usual grim apartment blocks of Soviet times. The city’s emblem is the shining Baroque cathedral called St. Sophia, which avoided Stalin’s destruction by serving as a museum. Today its gilded doors, glowing icons and frescoes enrobing every surface broadcast beauty once again. On another hilltop, a collage of monastic buildings circles Lavra Cathedral, where severe saints gaze upward at Christ and Archangels high in the dome. 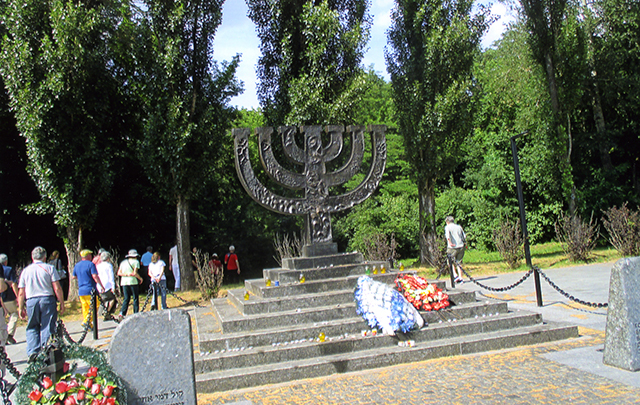 The city of Kiev features of a monument to the Jews murdered by Nazis in the Babi Yar ravine. We ventured into the countryside to stroll through an open-air history lesson—thatched-roof homes of centuries past gathered on the site in a reconstructed village, centered around a glorious wooden stave church. Then, onward to World War II and a far more grisly setting: the notorious Babi Yar—a deep ravine where Nazis force-marched 150,000 local Jews to line up for execution. Today trees have grown up, monuments have been erected, and a Holocaust Museum is in the planning stage. We return to the town’s Jewish neighborhood to visit a synagogue where, once again, life has taken root. Moms from the adjacent apartment complex gather to watch their kids and ply them with ice cream cones. A gala Captain’s Dinner, then time to trade addresses with our ship’s new friends, bid goodbye to sassy Irina and her crew, and head to the airport—already planning our next magical cruise. For information, visit VikingRiverCruises.com to put your dreams in motion, too.